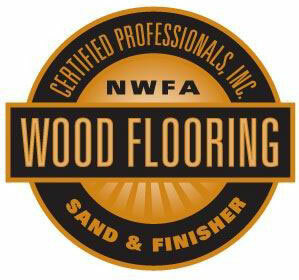 Chicagoland Flooring is Certified Professional Wood Flooring Sand and Finisher. This certification is a way of validating the industry knowledge and expertise. We are NWFA recognized expert in the field and you can trust that we will get the job done right. Finishing and refinishing by applying regular finishes and extra low-odor, quick drying, high-durability, non-yellowing finishes, such as wax, polyurethane, waterbased - all kinds: Swedish - Synteko or Swedish - Glitsa with sealer Glitsa or sealer Bacca. All these finishes can be done in 3 basic sheens: gloss, semi-gloss, sating, or special sheen. Repair of worn out, broken, missing or otherwise defective hardwood floors. Filling-up and patching of floor splits, holes, and other defects. Professional dustless floor sanding and buffing / screening with modern equipment. Staining - all colors - by using stain brand names: Basic Coating, Benjamin Moore, Bona Kemi, DuraSeal, MinWax, Flecto, Fuller O'Brien, Glitsa, McCloskey, Pratt & Lambert, Zar and others. Natural color offered in several shades without staining; also possible natural color with with non-yellowing floor finish. Removing of squeaky spots from floor and subfloors by different methods. Leveling of wooden and concrete floors and subfloors - new and old by various methods. Testing subfloors for moisture / vapors and general conditions to determine if treatment with additional materials necessary for better future floor condition (testing applied during installation / replacement of floor); if necessary, we install special barrier for moisture and vapors. A Certified Flooring Inspector is trained to inspect flooring problems and render a written opinion as to what party is responsible for the flooring failure. Wooden stairs job: installation, repair, sanding, bleaching, staining, and finishing. Gym floors - installation, repair, sanding, finishing (in accordance with NWFA specifications). At additional cost, move furniture and appliances out and put back in (not covered by our insurance); also at additional cost remove old carpet, tiles and others and dispose of debris.